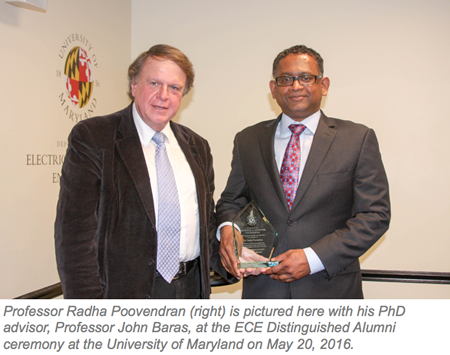 University of Washington Electrical Engineering Chair Radha Poovendran was honored with a 2016 ECE Distinguished Alumni Award from the University of Maryland (UMD). Professor Poovendran was one of three recipients awarded with the honor. The award was presented to him by his PhD advisor, Professor John Baras, at the UMD award ceremony on May 20. The Electrical and Computer Engineering (ECE) Distinguished Alumni Award was established in 2012 to recognize alumni who have made significant and meritorious contributions to their fields. Poovendran was nominated and honored for his major influence to the science and engineering field of cyber security. Poovendran received his PhD in electrical and computer engineering from the University of Maryland in 1999. He attributes many of his achievements today to having an excellent faculty advisor in Baras, as well as his own outstanding students at UW EE and great colleagues and collaborators at the UW and other organizations.